Great care has been taken in creating this glamorous angel wing ring. 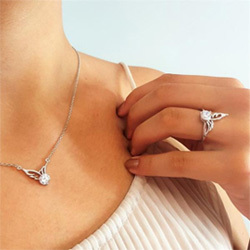 A glittering zircon is nestled safely under an intricately crafted angel wing, creating that unique Linda's Stars look. This piece should inspire you to relieve all worries and rest assured that in every moment, you are protected by divine grace and love. This precious ring I purchased after the loss of my dear parents and my brother and many dear friends. "Safe Under an Angel's Wing" is comforting to me every single day. The sparkle of the ring is more then I expected and receive many compliments on that and the design. I wear this ring for comfort and it is a treasure to keep. This ring is just beautiful on. I try to buy two of each ring in two sizes so I can wear them on different fingers. I love it. I love all my rings. This one is so beautiful on. I absolutely love this ring and will wear it all the time to remind me of my father. I love what I got it is very pretty. Love the ring. Will be ordering again from here. Love this ring for my middle finger. Looks great. I love my ring !! I wish I could get them ALL !! Hopefully more in the future. I love it... Every time I wear my ring, people smile and said I like your ring. Thank you so much for making my heart smile. It reminds me of my mother. My ring is beautiful !! I would tell people check out the pretty jewelry Linda'sAngels have !! It’s a gift for my. Daughter and I know she’ll love it. It’s beautiful. Should have got one for myself. Thanks!!! Love this ring. I will were it everyday.